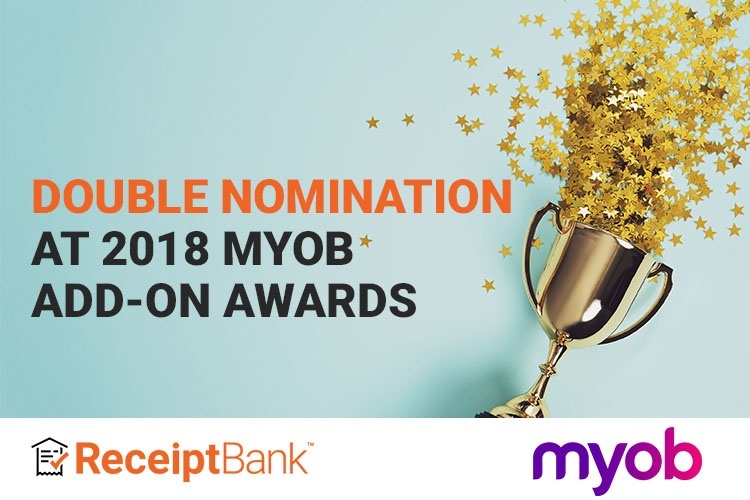 Receipt Bank has been announced as finalist in both Fastest Growing Add-on and MYOB Partner Choice Add-on at this year’s MYOB Add-on awards. The nominations follow our win last year for Fastest-Growing New Add-On, demonstrating the combined value of MYOB and Receipt Bank. In Australia, MYOB needs no introduction. The cloud-based online accounting solution helps small businesses better manage their finances and save time while remaining compliant. MYOB Essentials and MYOB AccountRight integrates with Receipt Bank to help accountants, bookkeepers and small business clients capture expense data on the go, taking advantage of automated data extraction and cloud document storage. In early 2017, it was clear that MYOB and Receipt Bank users wanted a collaboration between the platforms. In February 2017, MYOB AccountRight’s solution, including key cloud tools such as automated bank feeds, integrated with Receipt Bank. Since then, remarkable user growth has seen the partnership go from strength to strength. Plus, Receipt Bank was named the Fastest-Growing New Add-On later that year at MYOB Partner Connect 2017. The integration between MYOB and Receipt Bank enables clients to submit their receipts and invoices with a range of simple submission methods, including the Receipt Bank mobile app. These records and data can then be published to the ledger, either using cloud integration or manual sync. Following the rapid growth in users embracing we integrated with MYOB Essentials earlier this year (April 2018). Now, more businesses than ever can automate their manual bookkeeping work. Our collaboration with MYOB runs deeper than a combined cloud solution. In the past year, we have joined them on roadshows across Australia and their flagship Partner Connect conference. Every time, we are inspired by their unrelenting focus on innovation and enhancing customer experience. This gives them the opportunity to spend more time focusing on their clients’ business needs and offering advisory services, while maintaining a reasonable work/life balance. If you want to find out how Receipt Bank can help you streamline your MYOB practice, why not get in touch with our team?